This post is contributed by Sagar Kirit Shah, member of the Jain Vegans in the UK. In a world dominated by greed and materialism, the Jain community are leaders when it comes to demonstrating how to live a peaceful, low himsa lifestyle. For thousands of years, Jains have followed a strict vegetarian diet and lived in harmony with nature. And Jain monks and nuns illustrate how it is possible to live an empowering and fulfilling life without material possessions. Jains in the West continue to try to live by traditional principles. We try to lead modest lifestyles and participate in charitable activities when we can. We steer clear of activities and professions that involve violence or exploitation of other humans and animals. Despite being confronted with a variety of temptations, large numbers of us have continued to follow a strict vegetarian diet. While I’m tremendously proud of the example set by members of our community, I’ve always found it very difficult to understand why Jains, Hindus and other vegetarians seem to find it acceptable to wear leather. As a young child, I often used to ask my mum why it was wrong to kill cows to eat them, yet acceptable to kill them for clothing. My mum would explain to me that leather was taken from cows that were already dead. As I got older and learned to how to use the internet, I started to do research on where leather comes from. I discovered that my mum was both right and wrong. From a historical perspective, my mum was right. But she was completely wrong about the leather products that I grew up wearing and about the leather products that can be found in shops in the West today. While many Jains in India actually abstained from wearing leather, my mum was correct that many others found it acceptable to wear leather from cows that were already dead. Historically, Jain households would have had their own cows, treated them as members of the family and looked after them until death. While I’m not sure if I could ever feel comfortable wearing the skin of a being I consider to have been a member of my family, I see how using such leather could be viewed as acceptable for adherents of Jain principles. But just because wearing leather may have been acceptable then, it doesn’t mean it should be considered acceptable today. It is an unfortunate reality that none of the leather that we buy in shops today will come from cows that have died from natural causes. Almost all of the cows will have lived a life full of suffering and exploitation. And while we may try to fool ourselves into thinking that the cows are killed purely for the meat industry and that leather is a harmless by-product – this argument falls to pieces if you subject it to some simple economic analysis. A farmer does not rear cows to just produce meat. A farmer rears cows to make money. And every source of revenue is important. The International Council of Tanners estimates that the skins may be worth up to 15% of the value of the entire animal. By purchasing leather, members of the Jain community are effectively subsidising the meat industry. We are handing money to farmers who rear cows to kill them, and we are incentivising them to kill more. If everyone stopped buying leather, farmers would generate less money per cow, and this would reduce their incentives to rear and kill cows. The killing of cows is not the only problem with leather. There are also environmental issues to consider too; processing leather is a polluting and resource intensive activity. Most leather is chrome tanned, which can result in chromium being pumped into the water table. Up to 8000 litres of water may be required to process the leather needed to produce just one pair of shoes. But if members of the Jain community don’t wear leather, what will we wear? Fortunately, abstaining from wearing leather doesn’t mean that we will have to walk barefoot or go around wearing plastic flip-flops. 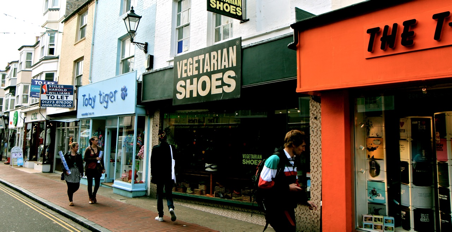 In the UK and US, we are fortunate to have a number of companies which specialise in making shoes suitable for vegetarians and vegans. These include Bourgeois Boheme in Notting Hill, London, Vegetarian Shoes in Brighton, and Free Rangers which makes shoes to order. For the Americans, there are a number of alternatives, including Pangea and Moo Shoes. There are vegan shoes at Zappo’s online and other mail order shoe shops. Many of us have been buying running shoes labelled all manmade-materials at a variety of stores, and Payless Shoe Source for mens’ and women’s dress shoes. In stores such as Payless that are “accidentally vegan” (the term PETA has used for food products that happen to contain no animal products) one cannot be sure that the glue that is used is completely vegan nor that the relatively low prices are not the result of poor working conditions in the countries where they were manufactured. Balancing cost, location and comfort with purchasing at item as important to try on as shoes means that some of us go to a store that isn’t all vegan product oriented. But it is a step in the direction of ahimsa, even if it is not perfect. It seems so logical, but so few seem to actual pause to reflect. Thank you for thinking. Every vegan advancement is a step towards a world I can deal with. It seems so logical, but so few seem to pause to actually reflect. Thank you for thinking. Every vegan advancement is a step towards a world I can deal with.